Biomedical optics focuses on the design and application of advanced optical techniques to solve pressing problems in medicine and biology. 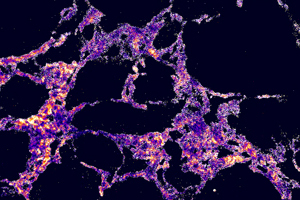 Using techniques such as Multiphoton Laser-Scanning Microscopy, Fluorescence Recovery After Photobleaching, Raman spectroscopy, near-field optics, and adaptive optics, we are probing tumor pathology, diffusion of cell surface receptors, single molecule spectroscopy, and the limits of human vision. This work is enhanced by the collaborative opportunities of sharing Robert B. Goergen Hall with the Institute of Optics. The Institute of Optics at the University of Rochester has been educating the next generation of leaders in the field since its founding in 1929 as the first optics department in the country, and approximately half of all optics degrees awarded nationwide have been awarded by the Institute of Optics. Biometric optics is truly a university-wide collaboration occuring between many departments, centers and researchers. The University of Rochester community is using advanced optical techniques as diverse as multiphoton laser-scanning microscopy, Raman Spectroscopy, diffuse optical tomography, and near-field optics to solve pressing problems in medicine and technology. Learn more.